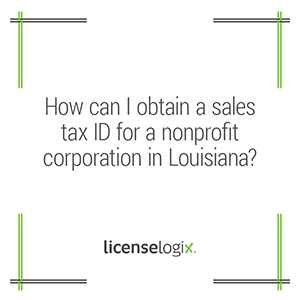 How to obtain a Sales Tax ID for Louisiana nonprofit corporation? According to the Louisiana Department of Revenue, a seller or lessor must obtain a sales tax certificate if they lease, rent, or sell tangible personal property in the state. This generally applies regardless of the business being a for profit corporation or a nonprofit corporation. Certain specific types of nonprofits are exempt from paying sales tax by statute. If your nonprofit does not fall under the statutorily exempt category, you will simply register for sales tax just as any other business in Louisiana. You can do this by submitting an Application for Louisiana Revenue Account Number. To make the process even easier, see our Louisiana Sales Tax ID page to learn how we can help you prepare and file the sales tax application. You can contact a licensing expert by submiting a question, calling us at (800) 292-0909 or via our online chat.